Unroll 1 pizza crust onto cookie sheet. Gently stretch crust to 12×10 in rectangle. Spread crust evenly with pizza sauce to within 1-in of edge of crust. Sprinkle with 1 pkg. Mozz. cheese, vegetables and second pkg. mozz. cheese. Reserve 1 tbsp. of parm. cheese; sprinkle remaining parm. cheese over. Top with second pizza crust; crimp edge with fork to seal. Sprinkle with reserve parm. cheese. Bake at 375 degrees F for 25-30 min or until evenly browned. Let stand for 5 min. before cutting. 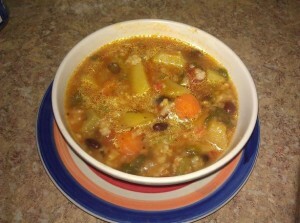 I love my crock pot, so I had to try this veggie soup in the crock pot recipe! 1. In a large soup pot, heat the one tablespoon of the olive oil over medium high heat. 2. Add the onion and cook till nearly translucent. 3. Now add the garlic. Don’t let the garlic brown and saute another couple of minutes. 4. Add the rest of the chopped veggies, sauteing for just a minute or two; the extra tablespoon of olive oil is if you need it for the rest of the veggies. Remember–you’re not cooking them– just sauteing them for the wonderful flavor this quick step will infuse in your soup. 5. Add the thyme and salt and pepper while sauteing. 6. Now put the veggies in the crock pot, add the tomatoes and broth. 7. Cook on low 7-9 hours (depending on your crock pot) or high 4-6 hours. 8. Just before serving, gently mash some of the potato chunks against the side of the crock pot to thicken the soup, give it a stir and serve. 1. In a large bowl, combine ricotta, spinach, 1 c mozzarella, ¼ c parmesan, egg, parsley, onion powder, pepper, and garlic powder. 2. 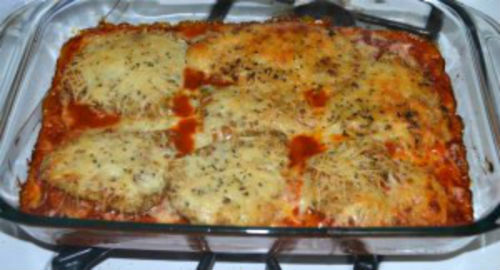 Combine spaghetti sauce and water; spread 1 c sauce in an ungreased 9×13 baking dish. 3. 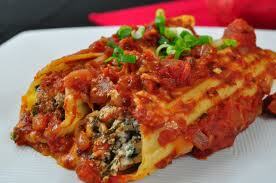 Stuff uncooked manicotti with spinach mixture; arrange over sauce. 4. Pour remaining sauce over manicotti. 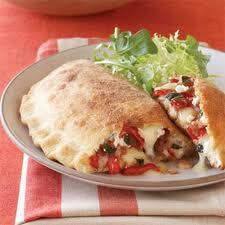 Sprinkle with remaining mozzarella and parmesan. 5. Cover and refrigerate overnight. Remove from fridge 30 min. before baking. 6. Bake uncovered at 350 for 40-50 min or until heated through. 1. In a saucepan, sauté onion, celery, and carrots in butter until soft but not brown. 2. Add tomatoes and a small amount of broth. 4. In a soup kettle, combine sautéed vegetables, remaining broth and rice. 7. Serve garnished with parsley. I like to serve this soup with grilled cheese sandwiches. This is a recipe from my mother. 1. In a large saucepan, melt butter. Sauté onions lightly. 2. Add flour, baking soda, and seasonings; blend well. 3. 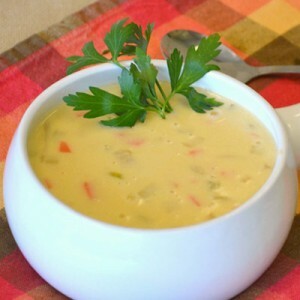 Slowly add milk and broth to butter-flour mixture, stirring constantly to make a smooth white sauce. 4. Add vegetables and cheese cubes. 5. Simmer for 15 minutes or until veggies are tender and cheese is melted. Do not boil. 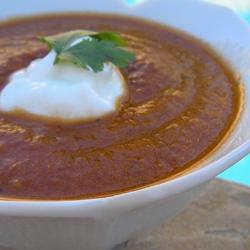 (If soup boils it may curdle). 6. Serve topped with parsley. Can be served with rolls, salad, or sandwiches. This recipe is also a family recipe.